Every Monday afternoon, 26 Eastern Kentucky University students visit the Morning Pointe assisted living facility in Richmond to provide therapeutic recreation services to 15 participating senior residents. Sherry Jones, professor in EKU’s Recreation and Park Administration department, has collaborated with Mariah Fosdick, Morning Pointe’s life enrichment director, to combine residents’ varied needs with students’ needs for hands-on learning in REC 411S, Therapeutic Recreation Services for Senior Adults. 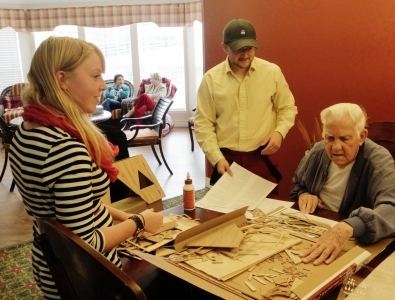 REC 411S is a service-learning class that requires students to participate in a “buddy project.” Students plan activities and visit a senior “buddy” on a weekly basis, putting their therapeutic recreation knowledge into action. In the past, students found their own buddies at various facilities across the community, “but we wanted something more structured than that,” Jones said. Thus, the partnership between Morning Pointe and EKU began in fall 2012. Beginning September 16, students met and began planning activities specifically for their buddies. One resident, Nick Martin, enjoys technology and learning about the new trends in the field. His buddies, Kyle Johnson and Mike Dizarn, used that interest to plan a geocaching trip to Lake Reba. Another resident, Elzie Nicely, enjoyed woodworking in the past, so his buddies, Stephanie Cole and Trenton Graham, have worked with him on building an intricate wooden dollhouse. Nila Cheap’s buddies tapped into her passion of painting and creating and, together, they have made seasonal artwork, flowerpot paintings and much more. Residents also have taken the opportunity to teach students games like Rook and bridge, play board games, garden and teach and perform piano pieces.